On this page, you will find references to articles and help topics sorted by categories. Back up and restore your database. Add music albums by title. Scan music files and folders into Musicnizer. Add albums by scanning barcodes with a web-camera. Use a barcode scanner to add music albums. Enter barcodes of albums manually. Add albums with multiple CDs. Creating a catalog of music files. Some hints on adding albums from audio files. Download information about your music albums from the internet. Download biographies, discographies of artists from the internet. Use different online music databases. Sorting methods on the "Collection" tab. Select all albums of an artist. Sorting the main list of albums. Creating new reports in the Report Builder. Print covers for Audio CDs. Sorting and filtering in Reports. Print a report by artists. Create an illustrated music catalog for Dune HD media players. 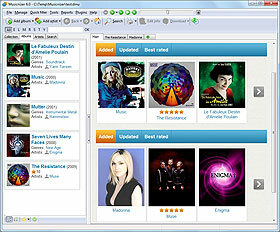 User interfaces (themes) in Musicnizer. Size of elements in Musicnizer. Linking albums to audio files. Changing paths to audio files. Using an external audio player program. Pictures in the music organizer.